Miami Gardens, FL – The Miami Dolphins are now 3-0. What’s more exciting is that the remaining AFC East teams are all 1-2! While it’s still too early in the season to celebrate being in 1st place, it’s definitely the perfect time to celebrate the win over the Oakland Raiders. When’s the last time Fins fans were in this position? Actually, not too long ago. In 2013, under Joe Philbin, the 3-0 undefeated Miami Dolphins ended 8-8 and missed the playoffs. Let’s hope that doesn’t happen this time around. The Raiders entered this week’s game with a 0-2 record, and were looking to bounce back under John Gruden, who is in his 1st season of his 10-year, $100 Million contract, returning to football to be the Raiders head coach. Gruden is known for being a great motivator, so it’s no surprise the Men in Black came out swinging. Less than one minute into the game, the Raiders took a 7-0 lead. That 1st drive was all Jordy Nelson. He caught a 61-yard pass from Derrick Carr, and ended the drive with a 12-yard TD catch. He scored the 3rd most fantasy football points for a wide receiver in most formats. The Fins punched back in the 2nd quarter. They took advantage of a botched punt and started at the Oakland 35-yard line. 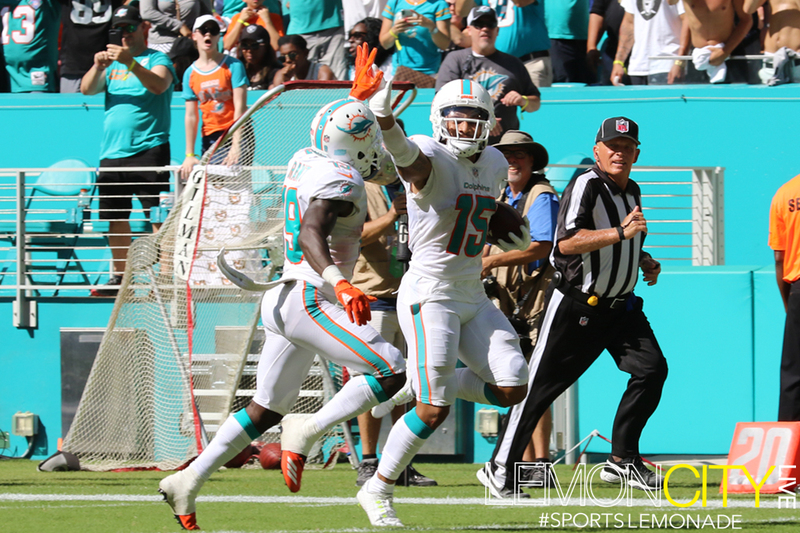 On 3rd and nine, Ryan Tannehill connected with Kenny Stills for a 34-yard TD that ended with Stills running into our photographer! She was ok. The Raiders marched right back down the field, but had to settle for a field goal, and that was the 1st half. The Dolphins defense was consistent throughout the whole game. They gave up 10 points in both the 1st and 2nd half, but came up big when it counted most. Early in the 1st half, they converted a turnover-on-downs in a goal-line stance, with rookie, Minkah Fitzpatrick (legal trademark owner of “Fitzmagic”) coming up with the stop. That play prevented the Raiders from taking a 14-0 lead. It’s nice to see your draft-picks make an immediate impact, huh? On the Raiders next drive, Xavien Howard recorded his 1st interception of the night, while covering Amari Cooper, who was held to two receptions for 17 yards! Howard’s 2nd interception came in the 2nd half, in the middle of two Dolphins scoring drives, helping them solidify the win. As good as the defense played, it was the offense that really took the W for Miami. In the 2nd half, Oakland once again scored on their opening drive. This time it was Marshawn Lynch going Beastmode, but Miami returned the favor. Jakeem Grant went full Mighty Mouse, scoring his 1st of two TD’s on an 18-yard pass from Ryan Tannehill. Tanne had himself a game too! He went 17-23, on 289 yards and three TD’s! Tannehill’s stats under Adam Gase are surprisingly good, surprising unless you’ve been paying attention. In his 16 games under Gase, he’s gone 315-463 for 3,682 yards and 26 TD’s. His 7.95 yards per attempt are 4th in NFL since 2016. His 98.0 passer rating is 7th in the NFL since 2016. His 68.0 completion pct. is 3rd in the NFL since 2016. He’s also got an 11-5 record! Those are playoff-caliber QB numbers. Another Fins player that had himself a game was Albert Wilson II. He threw a TD pass on one of the best-executed trickery plays I’ve ever seen, but he also completed a 74-yard TD catch, and high fived Grant on his way to the end zone! Miami sealed the deal, winning 28-20 on their way to 3-0. Next up, the Miami Dolphins travel to Foxboro to face their 1-2 division rivals, the New England Patriots. The Pats are coming off a humiliating defeat at the hands of the Detroit Lions. This will be the 1st division game for New England this season, and should serve as a gauge for how good Miami really is.